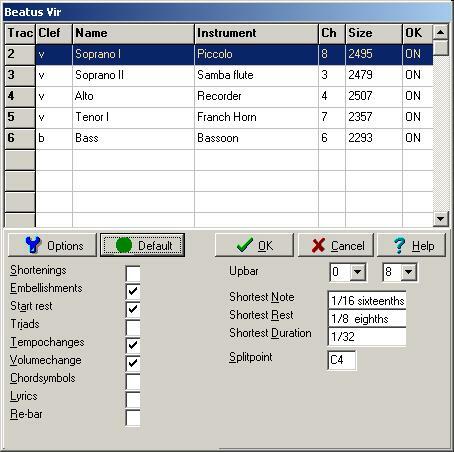 It is possible to import a MIDI-file in MusiCAD thereby converting it to an editable MusiCAD-file. However, conversion can be tricky sometimes. Especially live played performances are difficult to 'catch' using readable notation. On translating midi-events to notes you may define that (very) short notes may be notated using staccato signs. Embellishments like trill-signs may be used (or not) to when translating sequences of short notes. Sometimes bar lines dividing long notes require a 're-bar' operation. The split-point determines the lowest note that should be assigned to the treble-clef if a grand staff is chosen (select a P) for a part. Quantization parameters for Shortest Note, Shortest Rest and Shortest Duration to qualify for a note determine the resulting score.